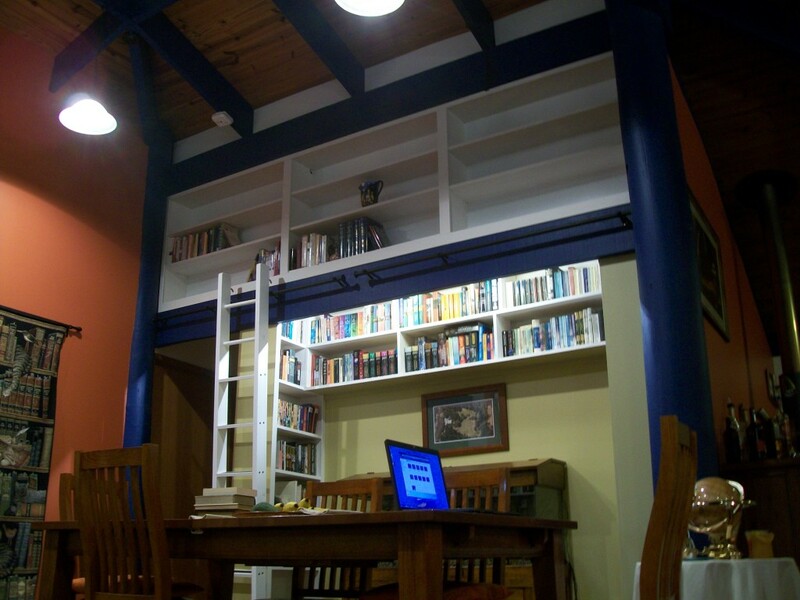 A couple of years ago, I finished the library ladder that made it possible to extend our bookcases all the way to the top of one wall in our living room. This weekend, I finished building in another bookcase on the other side of the same room. Step 1: get the stepladder, climb it several times, plan out how to realise Tamara’s wish to replace the very 1980’s style rippled glass panel high up on the wall with more book shelves. Step 2: buy hardware. Break off corner of one length of timber when slamming vehicle hatch closed. Step 3: climb stepladder 12 times, carefully dismantling and removing the glass panels in their aluminium frame. Break one panel in the process. Clean up glass. Step 4: climb stepladder 8 times to take all measurements. Discover that neither of the beams (blue) is level or perfectly aigned. Swear a bit. Step 5: cut and assemble the first of three sections to be lifted and joined together in situ. Disassemble. Rebuild properly. Undercoat. 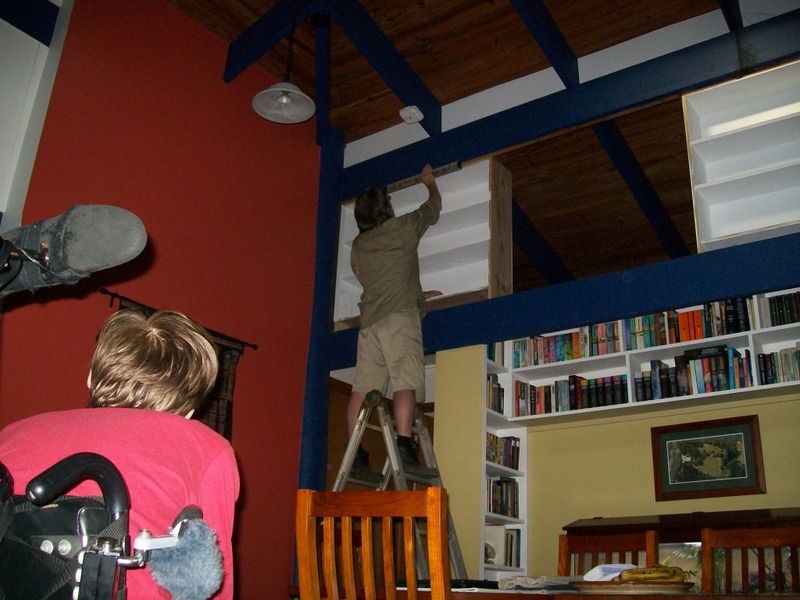 Climb stepladder, carrying bookcase up one rung at a time. Sweat a lot. Step 6: Assemble section two and three. Realise shelf heights in section two are wrong. Decide nobody will notice. Undercoat. Repeat most of step 5, especially the sweating. Step 7: climb stepladder at least 24 times while aligning (encouraging/bludgeoning) all pieces into place. Discover a bolt is in the way. Chisel out rebate to house bolt. Frame and top coat. Step 8: climb stepladder another 24 times to install brackets to hold rail for library ladder. Break off one drill bit and strip the heads off 3 supplied soft-as-butter screws. Swear a bit more. Supply own screws. 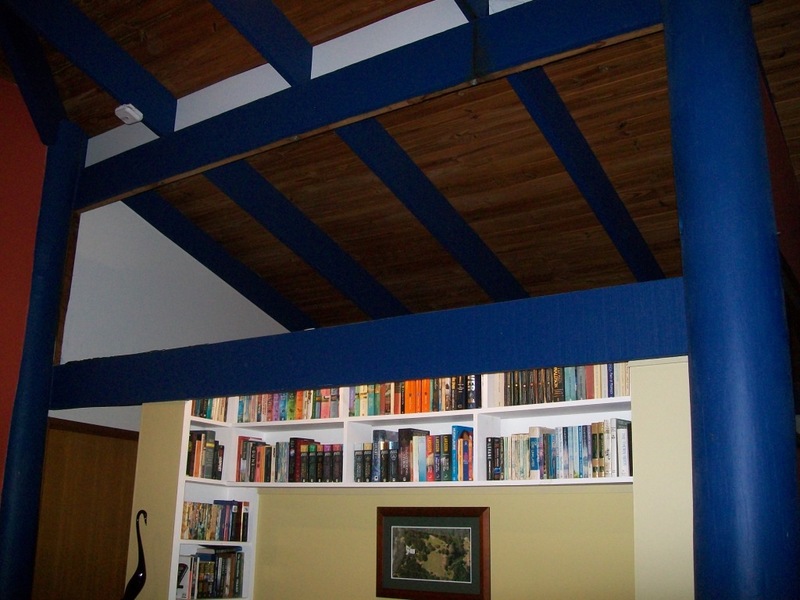 Step 9: dispense with stepladder and begin to use library ladder to start arranging books in their new home. Pain forgotten. Mistakes mostly covered. No longer sweating. Feel reasonably competent. ~ by Garry on May 8, 2011. Christopher must have had a ball. He especially enjoys overseeing my little stuff-ups along the way.